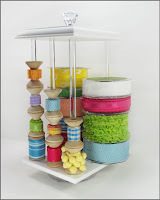 Welcome to another challenge from the Ribbon Carousel Blog! Thanks to those who played along with last months challenge, the theme at the Ribbon Carousel Blog for the month of December is The Holidays. I like to have little gifts on hand for the Postal Carrier, UPS Driver and those unexpected gifts I might need, so I used this months Ribbon Carousel Challenge Theme to create packaging for some Chocolate Covered Pretzels. 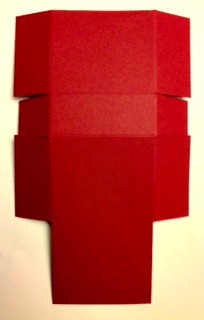 A few years ago, I had designed some Test Tube Boxes, that were all cut by hand. After getting a die cutting machine last year, I asked my friend Adela if she could turn my template into a cut file. My Double Test Tube Holder was the inspiration for my project. Not wanting to go back to cutting the template by hand, I altered the Cut File Adela made from my pattern, welding two of the single holders together, then removed the Circles and the flap portion that housed the test tubes. This is what the pattern looked like before being decorated. I used pattern paper from the Bo Bunny Rejoice line to embellish my box. 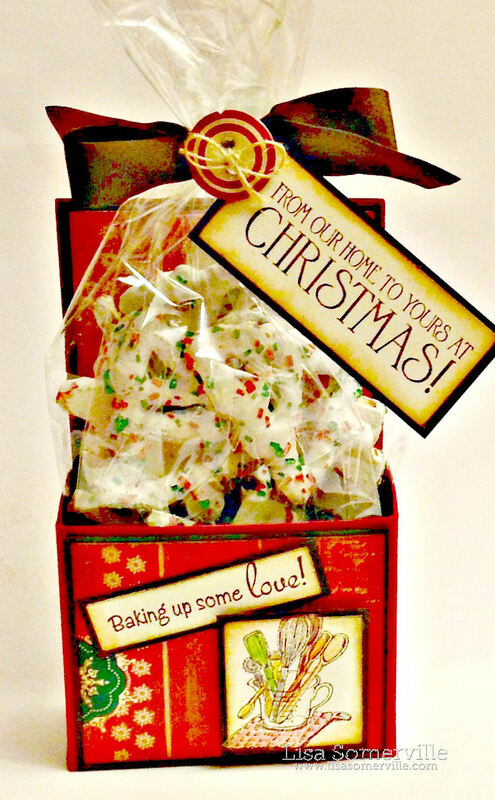 The Mixing Bowl and sentiment on the bottom portion of the box are from Our Daily Bread Designs Baking Tag Set. The image is colored with STAEDTLER Karat Aquarell Watercolor and EgroSoft Colored Pencils. The stamped image is trimmed so a small portion is slightly "out of the box". The sentiment on the bag is from Our Daily Bread Designs Christmas Door set. The bag is tied with Walnut Brown Vintage Seam Binding and embellished with a button tied with Natural Jute. To play along, simply create a project with a Holiday Theme and be sure to include some ribbon or twine! You have until December 25th to add your creation to this post at the Ribbon Carousel Blog. 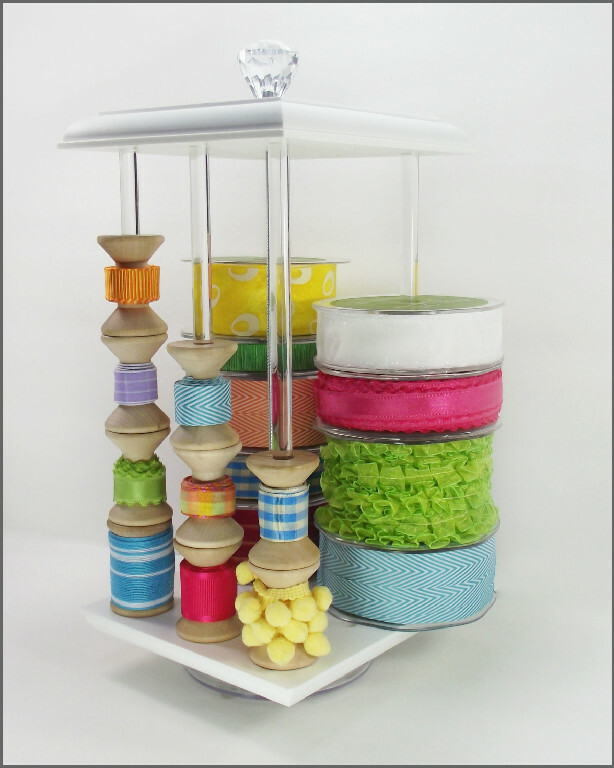 One Random Challenge Participant will receive one of these wonderful Ribbon Carousels! For more inspiration, click here to see the other DT Members projects. This is beautiful! Your thoughtfulness will be appreciated. Lovely idea for those little extra gifts which we always need... love your little box! I've never had chocolate covered pretzels but your project certainly makes me want to try them, Simply Gorgeous. Lisa, what a great project! I was wondering why all of a sudden so many people downloaded the file!